Some summits can only be reached by technical rock climbing. Unlike the crag, these locations can have extreme weather and a long duration of physical challenge. These characteristics are what make alpine rock climbing both rewarding and difficult. 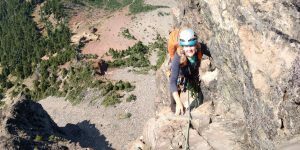 We guide climbers on alpine rock routes throughout the Pacific Northwest, and help rock climbers develop skills for the alpine environment.